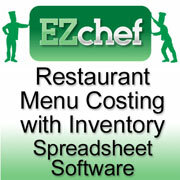 EZChefSOFTWARE® Inventory Management, Menu Costing and Analysis for Restaurants & Bars is a full-featured Microsoft Excel-based spreadsheet (Mac users see ** at end) application that is powerful, intuitive and easy to use. EZChefSOFTWARE® helps you save time, increase profits and learn to sell those menu items that make you the most money. Easily manages all food and beverage inventory tasks and processes. Performs standardized and accurate menu costing for every item on the menu (including subrecipes). Creates a full menu analysis from your sales mix (the sales proportions of menu items) to evaluate and visually display how each menu item impacts profitability. Provides twelve user-defined inventory categories (e.g. produce, meats, dairy) to suit your specific needs and menu. Creates and prints a weekly order guide for vendors that accommodate up to six orders per week and includes columns for user-defined par levels and current on-hand amounts to assist in ordering only what you need. Links your food and beverage inventory items and their current recipe unit costs into each menu item and subrecipe template. Permits the manual entry of inventory items and unit costs for those items that do not have a significant impact on cost. Auto-calculates each menu item’s portion cost, cost of goods sold and gross margin based on the item’s selling price. Provides ample space to document the preparation of each menu item and subrecipe. Prints each menu item and subrecipe with all documentation on a single formatted page. Based on the simple input of “item sales mix” information from your POS system (e.g. how many of each item sold in a time period), the software graphs each menu item based on the total gross profit dollars it produces and its corresponding cost of goods sold percentage. This allows you to visually compare the overall profitability of every item in each menu category against all other items in the same category. Auto-calculates the “ideal” or “theoretical” cost of goods sold percentage of each menu section independently and provides a summary for your entire menu. Performs “what if” analysis by permitting you to change the item selling price, the item cost or the number of each item sold. Use this information to optimize your menu’s overall profitability. Enter your one selection from the above in the Shopping Cart Checkout Special Instructions section when you check out. EZChefSOFTWARE® is a Microsoft Excel (Windows based**) application which makes it easy to use from day one (for those who are familiar with Excel). A visual and intuitive Main Menu screen (below) guides the user effortlessly from one task to the next. 1) Use the Main Menu "dropdown" windows to perform basic inventory tasks in one of twelve user-defined categories. 3) Use the Recipe Unit Conversion Tool to convert vendors’ "As Purchased Units" to the "Recipe Unit" that you will be using in your menu costing. 4) Print your current Inventory Sheets to take your month end or period end inventory counts (includes five user-defined locations). 5) Enter the inventory counts as obtained in #4 above. 6) View and print the Inventory Summary after all items are entered as shown above. Use this information to make "inventory adjustments" in your accounting system to create accurate cost of goods sold numbers and percentages in your profit and loss statement. 7) Make ordering easy by printing a weekly Vendor Order Guide, with current products and prices, for each food and beverage supplier. 1) To add a new menu item simply click on the "Add Menu Item and Sub Recipe" window and select the menu category you wish to add. 2) Use the "Recipe Search Form" to locate and/or edit existing Menu Items or Subrecipes. 3) A completed menu item template that includes both "linked" inventory items and manual or "unlinked" items. (The price of linked items, like "Beef, Flap Meat" automatically updates any time the vendor price is changed from the inventory section of the program. The price of manually entered items, like “Bread and Butter”, unless you do so directly. 4) To auto-link ingredients from the inventory section use the "dropdown" window under the Inventory Category column (e.g. select “Meats” in the image below) and then move to the corresponding row under the Inventory Item column. When you select the dropdown window in that cell you will view a list of all inventory items in the category. Once the inventory item is selected the program automatically inputs the correct recipe unit and the current unit cost. All you need to do now is input the Number of Units called for in the recipe and the program does the rest. Use your POS Menu Item Sales report for a specified time period and enter the number sold of each item in the menu category as shown below. Once this data is input the table reveals detailed menu engineering information comparing each menu item and its ranking. The theoretical food cost of each menu category is also calculated and displayed. 2) A graphical view of the above table is a more visual way to see each item's performance relative to all other items in the category. Each item is placed on a graph with the X axis (horizontal) representing the gross profit of each menu item for the period. The Y axis (vertical) plots the Food Cost % of each item. The most profitable items in that menu section are the primes with high profit dollars and low food cost percent, and conversely, the problems generate relatively low gross profit dollars and a corresponding high food cost percent. The standards and sleepers categories are menu items that either generate high gross profit at relatively higher food costs or items with low food costs that are high profit generators. Cross reference each item's number to the table above and click on any item to navigate back to the original recipe cost template for that item. Use this information to proactively manage the menu mix, selling price and item costs within each menu section. This is the most powerful and direct way to increase your restaurants overall profitability. Promote those items that make you money, de-emphasize those that do not. Re-price others either from the selling price or the menu cost to optimize your profits. * Your company's Sysco Order Guide, with all current inventory items and prices, can be easily and quickly exported directly from the www.esysco.net website or from a Sysco "SAM" order guide file obtained from your Sysco Marketing Associate. Video and text instructions for obtaining and importing the file into EZChefSoftware are included in the program's online documentation. Click here for a video clip demonstrating how easy and fast it is to import your Sysco Order Guide. From the EZChefSoftware help window, simply click on the Import button and select the order guide file from the location where you saved it on your computer's hard drive. In seconds, all your data is imported, and when you click OK you are automatically navigated back to the Main Menu to get started. ** This program is not compatible with Mac Operating Systems because it includes "macros" (programming features) written in the Windows version of Microsoft Excel. It can however be run on the "virtual" hard drive of a Mac computer with appropriate software installed (e.g. Boot Camp, Windows (all versions) and the PC version of MS Excel (2003, 2007 and above). Also be careful to note, Microsoft Office for the Mac is not the same as Windows. To run this program on the Mac, this program requires both the Windows operating system and Microsoft Excel for Windows. *Named companies are not sponsors or affiliats of EZChefSoftware, The Restaurant Resource Group, Inc., or FoodSoftware.com. EZChefSoftware is a trademark of Restaurant Resouce Group Consulting. "Microsoft" and "Microsoft Excel" are trademarks of Microsoft.